On Friday, Governor Hutchinson of Arkansas passed the emergency in-crop ban of Dicamba. After passing through the Arkansas State Plant Board, the Dicamba emergency plan, which would limit use for 120 days, made its way to the governor's desk. With the legislation approved by both the governor and the ASPB, the proposal will now make its way to the Legislative Council who meets next July 21 when they are speculated to vote on the final ruling. Additionally, Governor Hutchinson approved a “Pesticide Enforcement Response Regulation” proposal which will extend beyond the 120-day emergency rule which will allow fines greater than $1,000 and no more than $25,000. As of June 30, the Arkansas Agriculture Department documented 507 cases in 21 counties. The Brazilian government's investment bank, BNDES, which owns 21% of JBS SA, has been pushing for a shareholder meeting to get a clearer picture of how the recent scandals and fines will impact the company financially. At the meeting, expected to be held in the next 10 days, the minority shareholders plan to 'encourage' the Batista family to relinquish managerial responsibilities. The family's investment arm J&F Investimentos, owns 41% of JBS shares. Spring Wheat continues to be hit hard in South Dakota, North Dakota, and Montana as severe weather plagues the states. All three states have been suffering from severe drought which has rallied the wheat market. Frost was reported in areas of South Dakota the weekend of June 24, which was already suffering from major areas of drought. 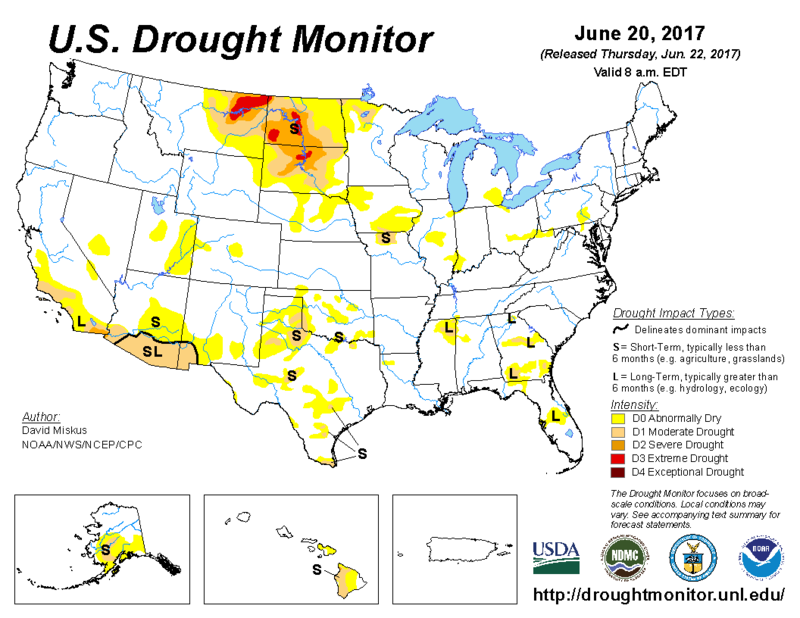 Totals drought conditions for each of the three states can be found on the U.S. Drought Monitor or here. The Brazilian Supreme Court has upheld a lower court's order that JBS cannot sell 300 million dollars worth of assets to Minerva SA, another south american meat processor, because the sale could impact the investigation in to corruption on the part of JBS executives. Dow Jones touched a record high earlier this morning. Energy stocks, driven by the move upwards in the price of crude oil, shot higher; along with bank and financial stocks. The drag in the equity markets was in technology stocks as investors looked to other sectors to see greater gains. Tune back in Wednesday for more news; have a Happy Fourth of July!